United Launch Alliance has postponed the next launch of a Delta 4 rocket from Oct. 23 to sort out the significance of fresh conclusions stemming from an investigation into an RL10 engine anomaly during another Delta 4 launch one year ago, the company said in a statement Friday. The launch company, which operates the Atlas and Delta rocket fleets, said it has not set a new date for the Delta 4 rocket's launch of the GPS 2F-5 spacecraft to replenish the U.S. Air Force's fleet of positioning, navigation and timing satellites. Engineers are reviewing whether they need to make any changes to the rocket's RL10B-2 second stage engine. During a similar Delta 4 launch of another GPS satellite in October 2012, the RL10 engine sprung a fuel leak in flight, causing the engine to fire with lower thrust than planned. 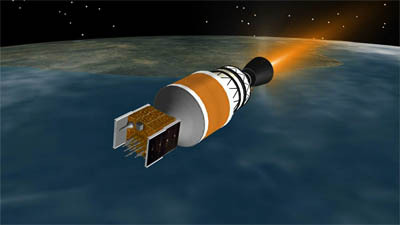 The Delta 4 rocket compensated for the low thrust by extending the duration of all three of its second stage engine burns to achieve the mission's desired target orbit. The October 2012 launch successfully deployed the GPS 2F-3 satellite into the correct circular orbit with an altitude of 11,000 nautical miles. The RL10B-2 engine is produced by Aerojet Rocketdyne. It generates a nominal thrust of 24,750 pounds, has an overall length of 13.6 feet, including 7 feet for its extendable nozzle, and a specific impulse of 465.5 seconds. 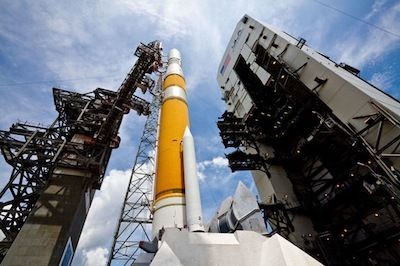 ULA and the Air Force gave the green light to resume Delta 4 launches this spring, with three successful flights occurring between May and August, lofting two Air Force Wideband Global SATCOM communications satellites and a top secret spy satellite for the National Reconnaissance Office. The Atlas 5 rocket uses a different type of RL10 engine, and although it shares design features with the Delta 4's RL10B-2 engine, officials cleared the Atlas 5 to continue flying throughout the last year. ULA said the upcoming Atlas 5 launch of NASA's Mars Atmosphere and Volatile Evolution, or MAVEN, mission remains on schedule for Nov. 18. MAVEN has a tight planetary launch window extending to mid-December. Officials kept probing the root cause of the RL10 engine anomaly to avoid similar problems in the future. "The ongoing Phase 2 investigation has included extremely detailed characterization and reconstructions of the instrumentation signatures obtained from the October 2012 launch and these have recently resulted in some updated conclusions related to dynamic responses that occurred on the engine system during the first engine start event," ULA said in a statement. The company said the launch of the GPS 2F-5 satellite "is being delayed to allow the technical team time to further assess these updated conclusions and assess the improvements already implemented and determine whether additional changes are required prior to the next Delta 4 launch." ULA said the Delta 4 rocket for the GPS 2F-5 mission has completed processing and checkout at the Complex 37B launch pad at Cape Canaveral Air Force Station, Fla. The GPS 2F-5 spacecraft, built by Boeing Co., is also at Cape Canaveral awaiting delivery to the launch pad once investigators recommend corrective actions or exonerate the Delta 4's RL10 engine. "A new launch date will be established when the assessment of the updated dynamic response information is completed in the coming weeks," the ULA statement said.